Meco's Solution for Accurate Silverspot Plating Where Mechanical Masking Becomes Impossible! 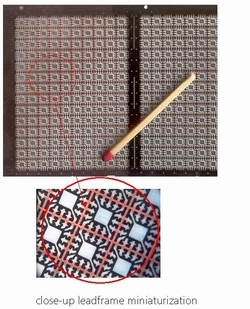 In general, spot tolerances of ± 125 micron in x and y direction can be reached by mechanical masking systems like Meco's patented spot tool technique. The disadvantage of mechanical masking is that you often get bleed-out of silver on the cutted edges of the leads as shown. Undesirable metal coating on these functional areas may result in poor adhesion of the mould compounds, while any silver extending beyond the package after molding may cause short circuiting among the leads as result of silver migration. Looking at the trends in leadframe design, ongoing attempts towards further miniaturization are observed. These developments result in a high lead density, thinner leadframes and packages. Such complicated and fragile leadframes are not stamped in reel to reel form, but more frequently in etched cut strips. It also requires a higher accuracy of silver spot position (±50 micron) like for QFN leadframes. Therefore Meco developed the ACP technology using photo masking techniques in combination with electro depositable photo-resist. The principle of the Meco ACP technology for selective silver plating of leadframes is based on a lithographic process with a negative-working, cataphoretic photo resist. 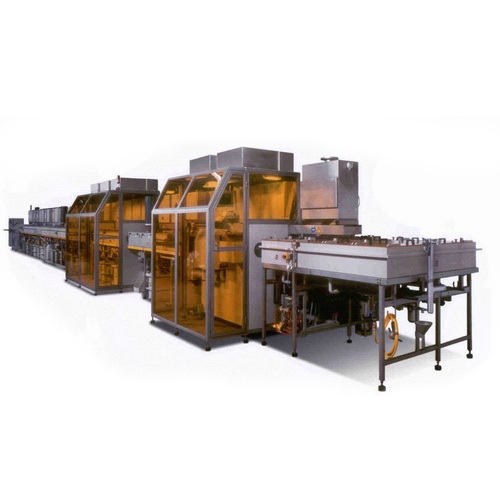 In this process an electrically insulating photo resist layer is applied to the leadframe by electrophoretic depostion, also efficienlty covering the sharp cut edges of the products. Subsequently, the photo resist is exposed to UV-light by means of a photo-mask, leaving the to be plated parts unexposed. All being operated at a continuous line speed of 3m/min! During developing, the unexposed photo resist is removed, followed by silver electroplating of the functional areas. Finally, the remaining resist is stripped away from the leadframe. 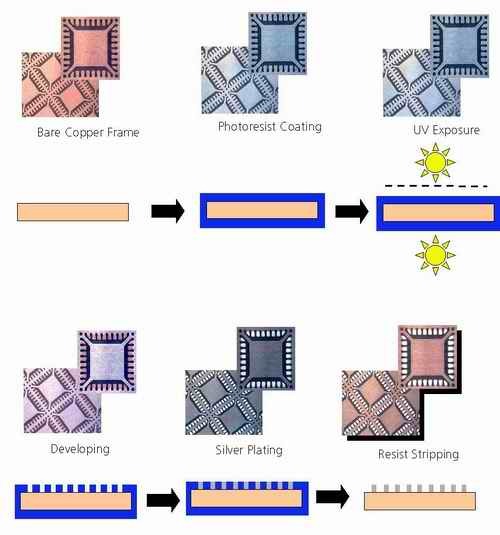 It is preferred to apply a negative-working photo resist in order to achieve efficient and accurate UV-exposure and a cataphoretic process (depostion at the cathode) to avoid any metal contamination of the resist solution from the leadframe.